Welcome back to the Lab. 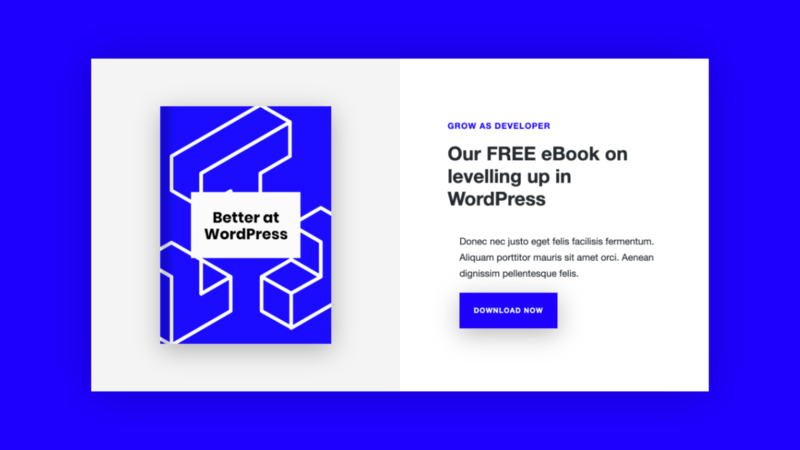 For this tutorial we’re going to build a custom eBook download/call-to-action block. It will include a picture of our book, some text, and a button to download the book. That’s it. Nice and simple. Let’s do this! Most of these are pretty self-explanatory. The final field Accent Coloris something a little extra. In our design we have that bold blue, but we’re going to make that configurable (apart from the actual image of the book that is). We’re going to let the person adding the block choose an “accent” color that will be used for the button and the little pretext on the right. So in our WordPress Admin and with the Block Lab plugin active, we go to Block Lab > New Block. Now let’s add all our fields as per our table above. You’ll notice that when you hit publish that over on the right a notification appears telling us that the plugin is looking for a template file. Currently it’s unable to find it and is letting us know. So let’s open up our text editor of choice and create the file. In our child theme, in the top level folder, we’re going to add a new folder called blocks. In this folder we’re going to create a file called block-ebook-cta.php. Notice that the notification lets us know what the file needs to be called. With this file saved we can go back to our Block Editor in WordPress, hit refresh, and we’ll see that our new template file is being picked up now. Great, so our template file is all set up. Now let’s build it out. Let’s first stub out our HTML and give the elements CSS classes. Note that we are sanitising our function outputs with esc_html. 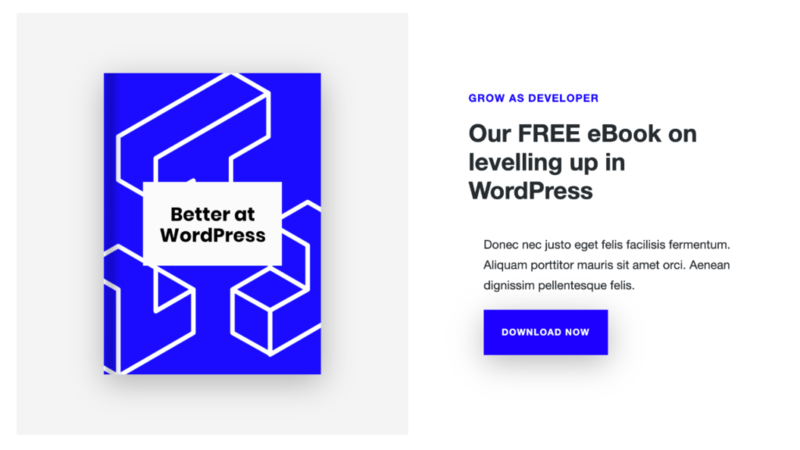 This follows WordPress coding best practices. You can learn more about that here. Before we move on to styling, we’re going to create a variable that can store the accent-color. We can then interact with this variable when styling. Note that when we added the Accent Color field to the block in the Block Editor, we gave it a default color so that the variable will always have a saved value. For our CSS styling we’re going use a new feature of Block Lab. In version 1.2.1 we introduced a better way to manage styling. 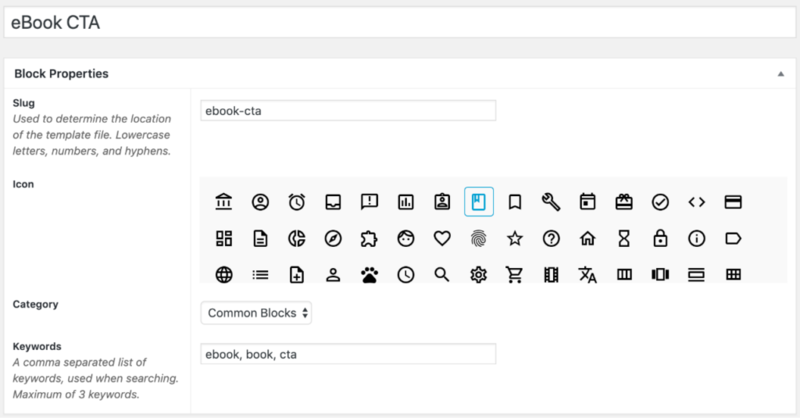 In our blocks folder we’re going to add a CSS file called block-ebook-cta.css. The plugin will auto-magically pair this file with the PHP file of the same name. And that is the final piece of this puzzle. 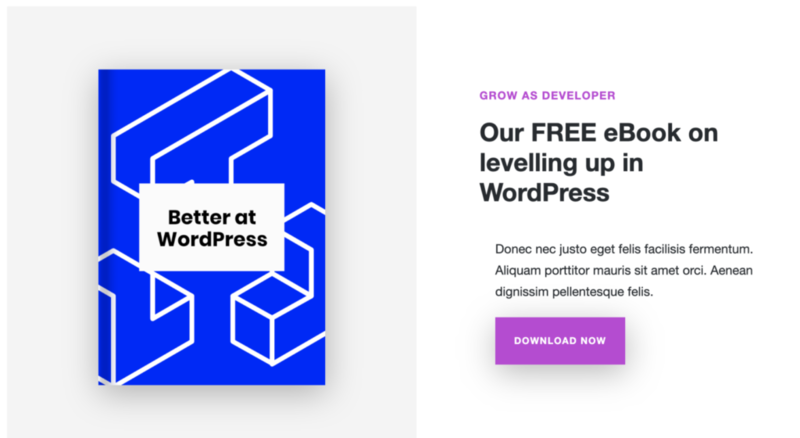 Let’s go create a new Page in WordPress, add our block, fill out the fields and see what it looks like. To change it up, let’s set the accent color to purple.